Since the discovery of its wreck site in 1985, the RMS Titanic has captured the imagination of people around the world. Now, RMS Titanic, Inc., an affiliate of Experiential Media Group, LLC. and the salvor-in-possession of RMS Titanic and its wreck site, together with the Advanced Imaging and Visualization Lab (AIVL) at the Woods Hole Oceanographic Institution (WHOI) and Marine Imaging Technologies (Marine Imaging) will join forces to preserve the site for generations to come. 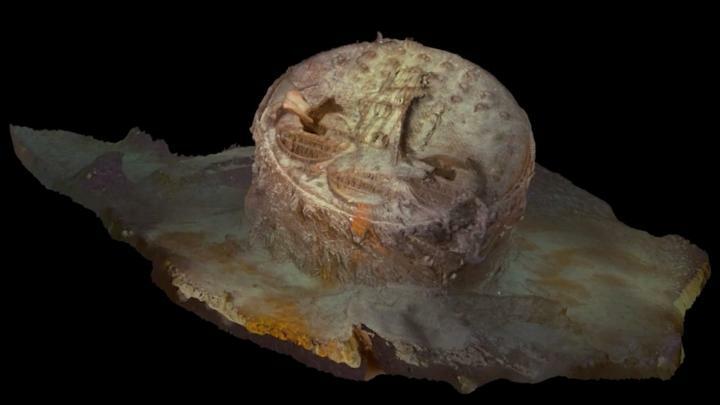 The group will apply advanced underwater imaging technology to monitor and document the wreck while shedding light on natural and human-caused changes to artifacts on the seafloor. The RMS Titanic Survey Data Scientific Study Center will focus on advanced and newly refined research methodologies, including underwater 3D imaging, that will lead to the clearest and most comprehensive data collected to date. In addition, the partners will work with maritime heritage archeologists on management strategies for preserving the wreck site and deliver new ways of viewing RMS Titanic through documentary and museum films, virtual reality (VR), simulator rides, and museum exhibitions. As part of the new center, AIVL and Marine Imaging are collaborating to create high-resolution (near-millimeter scale) 3D interactive models of the Titanic’s bow, stern and other artifacts distributed across the site located more than 4,000 meters (13,000 feet) beneath the surface. To date, AIVL has compiled and processed survey data from RMS Titanic expeditions in 1985, 1986, 1991, 2005, and 2010. This information is helping to improve understanding of structural and environmental changes that have occurred at the wreck site since the ship sank. In addition, this expedition survey data, when combined with RMST’s vast collection of imagery from multiple expeditions to the site, will provide a deeper understanding of the site at the time of discovery and add to forensic time-series studies. AIVL and Marine Imaging have already created the first 2D and 3D videos of the wreck site at resolutions greater than HD, including UDHDTV (4K) and 8K (IMAX), which can be made into 2D, 3D, panoramic, and VR production formats for future release to the public. The new methods will also offer new ways to study objects and features underwater in ways that traditional underwater imaging techniques cannot. The 3D interactive models that result will be used by archeologists to precisely monitor changes to the wreckage and to provide input for long-term management of the site. The Woods Hole Oceanographic Institution (WHOI) is a private, non-profit organization on Cape Cod, Massachusetts, dedicated to marine research, engineering, and higher education. Its primary mission is to understand the ocean and its interaction with the Earth as a whole, and to communicate this understanding for the benefit of society. For more information, please visit http://www.whoi.edu. The Advanced Imaging and Visualization Laboratory (AIVL) develops and operates innovative deep-sea imaging and telemetry systems for use in remotely operated vehicles, autonomous underwater vehicles, manned and unmanned aerial vehicles, diver-operated systems, as well as deep-diving human-occupied vehicles. AIVL’s precision imaging systems have been used all around the world in everything from underwater scientific and archaeological surveys to high-altitude animal health assessments and the documentation of rocket launches. In addition to supporting the scientific community, the imagery collected has been used for educational exhibits in numerous museums, science centers and repurposed for various television and film programs. About Experiential Media Group/ RMS Titanic, Inc.
Marine Imaging Technologies (Marine Imaging) designs and creates the technology necessary to capture mesmerizing and thought provoking imagery above and below the water. The company was founded by creative professionals and passionate engineers who share the desire to protect the oceans by reaching the core of what makes us human–telling stories and sharing emotions. The vision, imagination, and skills inherent in the team have led to pioneering technology used to inspire and help explain our underwater world.